A CLASSIC! 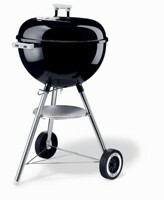 Weber kettle grills have been a mainstay in backyard grilling longer than I have been alive! I still have the one my Dad used when I was just a little meat eater! The Weber kettle is know for it's durability and ease of use. It's adjustable vents and grilling rack are perfect for all types of grilling. I use mine for mostly for "indirect cooking" (look for Sven's tips on Indirect and Direct cooking coming soon). I just set up some coals or apple wood off to one side and throw on some ribs and a away we go!! With out a doubt, If I could only use one grill...it would be the Weber. You can see all of the specs and features at here.